Ostensibly the chronologically asynchronous memoirs of Alden Dennis Weer, Peace is a meditation on fabulation. Through the narrator's examination of his own life and the contingent tales and anecdotes that he and other characters relay, the reader comes to reflect on the ways in which their own lives are stories, imperfectly told, incompletely remembered, and perhaps like Gold the antiquarian bookseller's artifacts, forgeries. Like memory itself, the book is incomplete. For example, the reader concludes the relatively short work knowing a good deal about Weer's childhood and middle age, but cannot say with any precision how it came about that the forty year old engineer became the rich fifty year old entrepreneur of an orange juice analogue made out of potatoes. Weer not only remembers, but appears to relive his past, seemingly without changing it, although the recurrent trope of revenance, the ghost that returns, stalks the work and is significant symbolically. The work does have an historical present of sorts, with the narrator wandering from room to room of a house which is familiar to him within which he continues to write his memoirs (which are contiguous with the book the reader holds in their hands) and which he appears to have had built, although ultimately this construction is perhaps no more than the prison house of memory. The narrator is a sense a 'hungry ghost' archetype, haunting his own life but destined never to enjoy the book's titular repose, and spectral forms figure widely in the work. Weer revisits but never lives again fully within his own experiences, and through his drifting from recollection to recollection Wolfe conveys an arresting sense of how memory can precipitate strong emotions and near-experiential, almost hallucinatory sensations, but nevertheless cannot temporally return to the event in question to live through it again, either to savour the experience anew or amend its outcome. Peace is a work which invites its decipherer to read more into it than it is perhaps trying to say. Our lives are stories, but unlike Alden Dennis Weer's they will end. 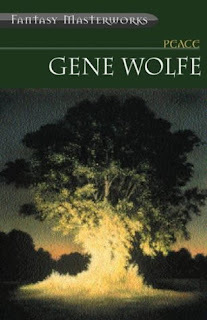 Life is, like the cover of this Fantasy Masterworks edition, arborescent. It can only grow upwards and outwards, and to torture the boughs of experience by binding them together or attempting to influence their development is not only an exercise in frustration but in a sense an aberration, a denial of the fact that the past cannot be fixed, and a failure to acknowledge that the future can be shaped by our actions in the present. Even if we can no longer accurately discern it, our pasts remain immovable as the notes Weer frequently encounters within the work which he wishes to take up, only to find that they are nailed to the furniture.